120 mm/40 41st Year Type2 х 1 pcs. Initial HE Shell Velocity660 m./s. Initial AP Shell Velocity660 m./s. 80 mm/40 41st Year Type5 х 1 pcs. 120 mm/40 41st Year Type3 х 1 pcs. Umikaze — Japanese Tier II destroyer. Tier II's Umikaze sets the trend for Japanese destroyers with its deadly torpedo armament. Its torpedoes, although relatively slow, are very fast to reload, are only detectable by enemy ships at very short range, and have a relatively long range with the upgraded torpedoes. 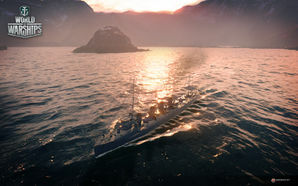 Players need to capitalize on the upgraded torpedoes' long range by using this ship primarily as a torpedo boat, attacking enemy ships with torpedoes while staying undetected. Players should refrain from using its main guns and only use them as last-resort weapons. High concealment and upgraded torpedo range give a 2.4 km leeway for torpedo runs. Very fast compared to other ships it will normally face. Severely lacking in gun firepower due to low number of guns with a slow turret rotation speed and rate of fire. Players advised to research the second torpedoes first as it give a huge increase in range to enable stealth torpedo run and slight increase in damage potential. The Umikaze-class destroyers (海風型駆逐艦) were a class of two destroyers of the Imperial Japanese Navy designed after the Russo-Japanese War, as the Imperial Japanese Navy realized that the vessels in its current fleet of destroyers were too small and poorly designed for extended “blue water” operation. The Umikaze-class ships were based largely on the Royal Navy Tribal-class destroyers. Two ship of this class were commissioned, Umikaze and Yamakaze. The Umikaze class used heavy oil-fired Parsons steam turbine engines, which was a first for Japan. The rated power of 20,500 shaft horsepower gave the vessels a high speed of 33 knots (61 km/h), however fuel consumption severely limited its operational range. Armament was increased over the previous classes, with a pair of QF 4.7 inch Gun Mk I - IV guns, with one gun mounted on a small shelter forward and another on the quarterdeck and five QF 3 inch 12-pounder guns mounted staggered to port and starboard. The number of torpedoes was initially three in un-+reloadable tubes, but this was quickly changed to two in reloadable tubes in operational service. The Umikaze ships were rated at first-class destroyers on 28 August 1912, and served to 1 June 1930 when both were converted to minesweepers. Both were subsequently scrapped in 1936. This page was last modified on 17 May 2018, at 19:17.